A: Among humans malaria is transmitted through the bite of a mosquito present in certain areas of the world. Symptoms only appear a few days after the bite. If the disease is not treated it may be fatal, particularly among the most vulnerable groups (pregnant women and children). Q: What are the symptoms ? A: Symptoms of malaria include fever, shivering, pain in the joints, headaches, repeated vomiting, convulsions and coma. If left untreated, the disease may progress to severe malaria and sometimes death. Q: What is the situation like in Mali? A: Malaria is the primary cause of death among children under 5 and is becoming an increasingly significant factor in the country’s health system. Two million children under 5 have an average of two attacks of malaria a year. Out of those two million, 100 000 will have a severe attack with neurological complications or will die. Malaria accounts for 50% of deaths among children under five. Q: Which treatments are ineffective? A: Chloroquine appeared in the 1950s, but intensive use of it was a contributory factor in the emergence of parasite resistance during the 1960s in Asia and towards the end of the 1970s in Africa. Another drug, sulfadoxine–pyrimethamine (SP) was introduced on a large-scale in response to this problem. Unfortunately resistance again developed, this time within a period of five years. Q: What is artemisinin-based combination therapy (ACT)? A: There is now an effective new treatment based on derivatives of artemisinin, a Chinese herbal remedy. The term artemisinin-based combination therapy (ACT) is used to describe the administration of artemisinin in association with another substance that is still effective (e.g. Fansidar®, amodiaquine or mefloquine). Combination therapy prolongs and reinforces the effects of the treatment, as well as delaying the onset of resistance. Q: What is MSF doing in Mali? 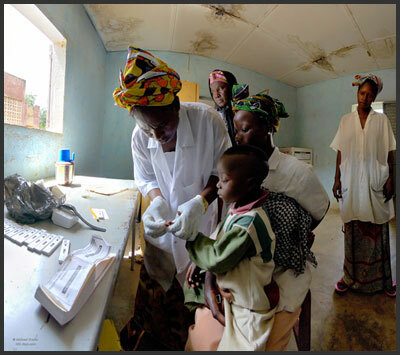 A: MSF is supporting health centres at Kangaba, in southern Bamako. As a result of their support the health centres have access to ACT and provide free medical care for women and children suffering from malaria. Q: What has changed since October 2005? A: Action is now being taken at national level to ensure that ACT will be available before the end of 2007. The government has decided to withdraw chloroquine from the market and health centres and to replace it with stocks of ACT. MSF is encouraging the various parties involved to provide free malaria treatment. In a country where most of the population earns less than one euro a day it is essential to ensure that patients do not have to bear the cost of treatment and consultations.